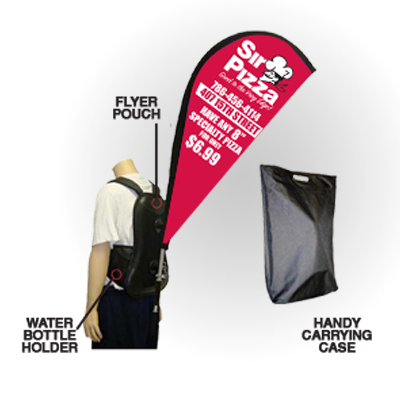 Backpack Banners Printed in Full Color on 9oz Premium Polyester Fabric and comes with a carrying case. Printed in full color on 9oz premium polyester fabric. Ships with one premium backpack mount. A Backpack Banner will have your brand standing out within the crowd. 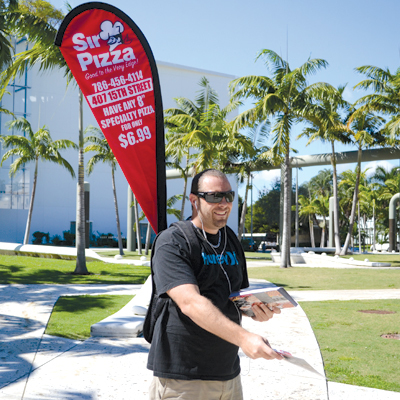 You can now promote your flyers and brochures hand to hand and still gain promotion from afar while your brand flies over head., This light weight high impact advertising banner is only 3lbs and includes a flyer or brochure pouch and water bottle holder. We can offer your custom full color design printed with the same image on both sides of the banner or a different image for each side. Get noticed today and order your Backpack Advertising Banner for your business or event. Each order includes one backpack holster.